Welcome to Down Syndrome Awareness Month 2013! Today I'd like to tell you about the Buddy Walk. I should be a pro by now, since this is our third year to participate. The Buddy Walk was created by the National Down Syndrome Society in 1995 to celebrate Down Syndrome Awareness Month as well as promote acceptance and inclusion of people with Down syndrome. My local Down Syndrome Association (formed in 1979) started doing a Buddy Walk in 2002, with about 500 people attending. In 2011, our local Buddy Walk had over 6000 people in attendance! Of the Buddy Walks arranged / planned by volunteers, our local event was the largest in the country! Now... what is the walk, really? The events can vary by date and activities in every state and/or city. At OUR event, there has been an area of inflatables for the kids. There were vendor tables from area therapy companies, doctors, etc. Each vendor offered a carnival type game and prizes. One vendor had chalk and the kids got to draw on the basketball court. A local exotic animal rescue brings animals out for display. McDonald's gave away free burgers and nuggets. There was a booth giving away free Disney books / book sets! Last year it was a super hero pop up book! The Buddy Walk goes on for 3½ hours. An hour before it ends, the walk begins. Last year it was about half a mile, walked parade style. The walk is lined with signs from more sponsors as well as mascots and cheerleaders. Most teams carry flags, some have matching shirts. Toward the end of the walk, Olympic-style medals are given to all participants. This event is entirely FREE. For everyone. Registration is encouraged, but not required. Registration gets you a goodie bag and t-shirt. Registration this year is $10 per person, but is always free for people with Down syndrome. We use the event to raise money for our local association and some for the national organization to fund programs that promote acceptance and inclusion of people with Down syndrome. I feel like it is a worthy cause. I suppose that is easy to say, as the mother of a son with DS. If you can spare even just a few dollars, every little bit helps. Please click over to our page to learn more and to donate. You can also click the image to the left to get to our page. 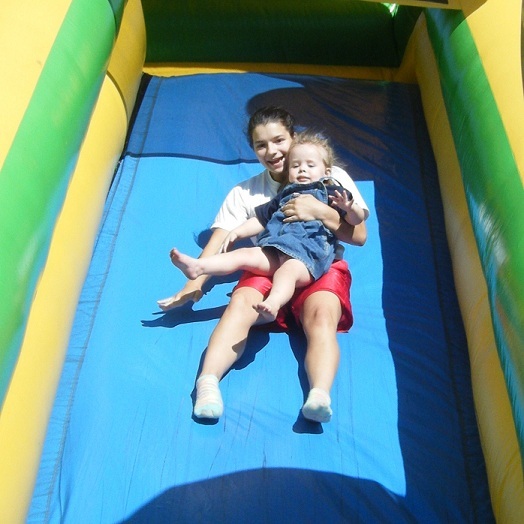 Our 2013 Buddy Walk is next weekend! We're a long way from our goals (for team members and for donations). Have you ever participated in a walk (or run) for a cause?